Loop over Carter Dome to S and M Carter? Now find the highest ones - the tall one is pretty much Moosilauke, Carter Dome or South Twin. Then, what has three peaks that are close together and have approximately matching elevations? Pretty much only can be the Carters. Load up a Carters profile and voila! It was a kind of crappy day so I didn't bother with Hight, which is unusual, since I love that view. Last edited by bikehikeskifish on Wed Dec 10, 2014 8:55 pm, edited 1 time in total. Yes. It's the Carter's. Tim's profile shows. 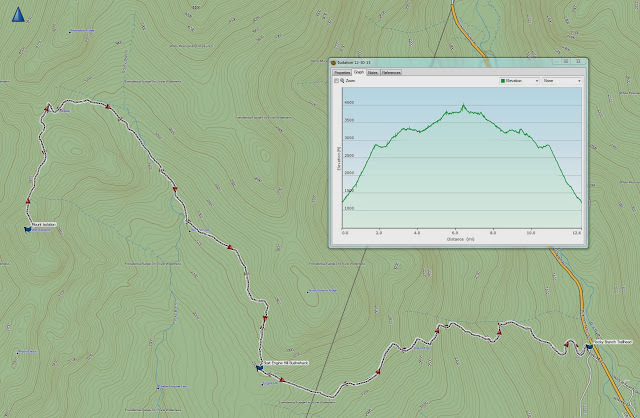 What hike is about 12.5 miles (more than 12, less than 13) and has 3 or more peaks? Tims reasoning is what was going through my head but I've never made a GPS track in my life so has nothing to go on. May explain why I am worse at this game than the picture guessing one if that's possible. If each of those bars is three hundred feet like it seems to be in the others this one appears to just top 4000, so based on the profile I'll say Tecumseh from ski area. I'll go with Moriah for that one. That generally is a terrible assumption to make.